How Hillary Clinton Became a Hawk - Helen Caldicott, M.D. See Dr Caldicott’s comment at the end of this article. She leaned forward as she spoke, gesturing with her hands and laughing easily. In talking with reporters, Clinton displays more warmth than Obama does, though there’s less of an expectation that she might say something revealing. Clinton singled out, as she often would, the United Nations climate-change meeting in Copenhagen the previous December, where she and Obama worked together to save the meeting from collapse. She brought up the Middle East peace proc­ess, a signature project of the president’s, which she had been tasked with reviving. But she was understandably wary of talking about areas in which she and Obama split — namely, on bedrock issues of war and peace, where Clinton’s more activist philosophy had already collided in unpredictable ways with her boss’s instincts toward restraint. She had backed Gen. Stanley McChrystal’s recommendation to send 40,000 more troops to Afghanistan, before endorsing a fallback proposal of 30,000 (Obama went along with that, though he stipulated that the soldiers would begin to pull out again in July 2011, which she viewed as problematic). She supported the Pentagon’s plan to leave behind a residual force of 10,000 to 20,000 American troops in Iraq (Obama balked at this, largely because of his inability to win legal protections from the Iraqis, a failure that was to haunt him when the Islamic State overran much of the country). And she pressed for the United States to funnel arms to the rebels in Syria’s civil war (an idea Obama initially rebuffed before later, halfheartedly, coming around to it). That fundamental tension between Clinton and the president would continue to be a defining feature of her four-year tenure as secretary of state. In the administration’s first high-level meeting on Russia in February 2009, aides to Obama proposed that the United States make some symbolic concessions to Russia as a gesture of its good will in resetting the relationship. Clinton, the last to speak, brusquely rejected the idea, saying, “I’m not giving up anything for nothing.” Her hardheadedness made an impression on Robert Gates, the defense secretary and George W. Bush holdover who was wary of a changed Russia. He decided there and then that she was someone he could do business with. “I thought, This is a tough lady,” he told me. A few months after my interview in her office, another split emerged when Obama picked up a secure phone for a weekend conference call with Clinton, Gates and a handful of other advisers. It was July 2010, four months after the North Korean military torpedoed a South Korean Navy corvette, sinking it and killing 46 sailors. Now, after weeks of fierce debate between the Pentagon and the State Department, the United States was gearing up to respond to this brazen provocation. The tentative plan — developed by Clinton’s deputy at State, James Steinberg — was to dispatch the aircraft carrier George Washington into coastal waters to the east of North Korea as an unusual show of force. But Adm. Robert Willard, then the Pacific commander, wanted to send the carrier on a more aggressive course, into the Yellow Sea, between North Korea and China. The Chinese foreign ministry had warned the United States against the move, which for Willard was all the more reason to press forward. He pushed the chairman of the Joint Chiefs of Staff, Mike Mullen, who in turn pushed his boss, the defense secretary, to reroute the George Washington. Gates agreed, but he needed the commander in chief to sign off on a decision that could have political as well as military repercussions. Obama, though, was not persuaded. The George Washington was already underway; changing its course was not a decision to make on the fly. “I don’t call audibles with aircraft carriers,” he said — unwittingly one-upping Clinton on her football metaphor. As Hillary Clinton makes another run for president, it can be tempting to view her hard-edged rhetoric about the world less as deeply felt core principle than as calculated political maneuver. But Clinton’s foreign-policy instincts are bred in the bone — grounded in cold realism about human nature and what one aide calls “a textbook view of American exceptionalism.” It set her apart from her rival-turned-boss, Barack Obama, who avoided military entanglements and tried to reconcile Americans to a world in which the United States was no longer the undisputed hegemon. And it will likely set her apart from the Republican candidate she meets in the general election. For all their bluster about bombing the Islamic State into oblivion, neither Donald J. Trump nor Senator Ted Cruz of Texas have demonstrated anywhere near the appetite for military engagement abroad that Clinton has. Political conversion came later, after Vietnam and the ’60s swept over Wellesley College, where she spoke out against the establishment at her graduation. But even in the tumultuous year of 1968, she was still making her transition from Republican to Democrat, managing to go to the conventions of both parties. As a Republican intern in Washington that summer, she questioned a Wisconsin congressman, Melvin Laird, about the wisdom of Lyndon B. Johnson’s escalating involvement in Southeast Asia. It was after law school that she had her most curious encounter with the military. In 1975, the year she married Bill Clinton, she stopped in at a Marine recruiting office in Arkansas to inquire about joining the active forces or reserves. She was a lawyer, she explained; maybe there was some way she could serve. The recruiter, she recalled two decades later, was a young man of about 21, in prime physical condition. Clinton was then 27, freshly transplanted from Washington, teaching law at the University of Arkansas in Fayetteville and wearing Coke-bottle eyeglasses. “You’re too old, you can’t see and you’re a woman,” he told her. “Maybe the dogs will take you,” he added, in what she said was a pejorative reference to the Army. 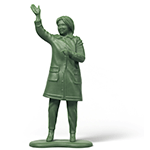 Clinton’s next sustained exposure to the military did not come until she was first lady, almost two decades later. Living in the White House is, in many ways, like living in a military compound. A Marine stands guard in front of the West Wing when the president is in the Oval Office. The Mili­tary Office operates the medical center and the telecommunications system. The Navy runs the cafeteria, the Marines transport the president by helicopter, the Air Force by plane. Camp David is a naval facility. The daily contact with men and women in uniform, Clinton’s friends say, deepened her feelings for them. When Clinton was elected to the Senate, she had strong political reasons to care about the mili­tary. The Pentagon was in the midst of a long, politically charged process of closing military bases; New York State had already been a victim, when Plattsburgh Air Force Base was closed in 1995, a loss of 352 civilian jobs for that hard-luck North Country town. New York’s delegation was determined to protect its remaining bases, especially Fort Drum, home of the Army’s 10th Mountain Division, which sprawls over a hundred thousand acres in rural Jefferson County. In October 2001, a month after the 9/11 terrorist attacks, Clinton traveled to Fort Drum at the invitation of Gen. Buster Hagenbeck, who had just been named the division’s commander and would be deployed to Afghanistan a month later. Like many of the officers I spoke with, he had preconceptions of Clinton from her years as first lady; the woman who showed up at his office around happy hour that afternoon did not fulfill them. It was the start of a dialogue that stretched over two wars. In the spring of 2002, Hagenbeck led Operation Anaconda, a 16-day assault on Taliban and Al Qaeda fighters in the Shah-i-Kot Valley that was the largest combat engagement of the war to date. When the general came back to Washington to brief the Joint Chiefs of Staff, Clinton took him out to dinner on Capitol Hill for her own briefing. They also spoke about the Bush administration’s preparations for war in Iraq, something which Hagenbeck was following anxiously. The general, it turned out, was more of a dove than the senator. He warned her about the risks of an invasion, which was then being war-gamed inside the Pentagon. It would be like “kicking over a bee’s nest,” he said. Hagenbeck excused Clinton’s vote in 2002 to authorize military action in Iraq. “She made a considered call,” he says. And “she was chagrined, much after the fact.” For him, what mattered more than Clinton’s voting record was her unstinting public support of the military, whether in protecting Fort Drum or backing him during a difficult first year in Afghanistan. Clinton’s education in military affairs began in earnest in 2002, after the Democratic Party’s crushing defeat in midterm elections moved her up several rungs in Senate seniority. The party’s congressional leaders offered her a seat on either the Senate Foreign Relations Committee or the Senate Armed Services Committee. She chose Armed Services, spurning a long tradition of New York senators, like Daniel Patrick Moynihan and Jacob Javits, who coveted the prestige of Foreign Relations. Armed Services deals with more earthbound issues, like benefits for veterans, and it had long been the preserve of Republican hawks like John McCain. But after 9/11, Clinton saw Armed Services as better preparation for her future. For a politician looking to hone hard-power credentials — a woman who aspired to be commander in chief — it was the perfect training ground. She dug in like a grunt at boot camp. Hillary Clinton is the last true hawk left in the race. Andrew Shapiro, then Senator Clinton’s foreign-policy adviser, called upon 10 experts — including Bill Perry, who was defense secretary under her husband, and Ashton Carter, who would eventually become President Obama’s fourth defense secretary — to tutor her on everything from grand strategy to defense procurement. She met quietly with Andrew Marshall, an octogenarian strategist at the Pentagon who labored for decades in the blandly named Office of Net Assessment, earning the nickname Yoda for his Delphic insights. She went to every committee meeting, no matter how mundane. Aides recall her on C-SPAN3, sitting alone in the chamber, patiently questioning a lieutenant colonel. She visited the troops in Afghanistan on Thanksgiving Day in 2003 and spoke at every significant military installation in New York State. By then — 30 years after she recalled being rejected by a Marine recruiter in Arkansas — Hillary Clinton had become a military wonk. Jack Keane is one of the intellectual architects of the Iraq surge; he is also perhaps the greatest single influence on the way Hillary Clinton thinks about military issues. A bear of a man with a jowly, careworn face and Brylcreem-slicked hair, Keane exudes the supreme self-confidence you would expect of a retired four-star general. He speaks with a trace of a New York accent that gives his pronouncements a rat-a-tat urgency. He is also a well-compensated member of the military-industrial complex, sitting on the board of General Dynamics and serving as a strategic adviser to Academi, the private-security contractor once known as Blackwater. And he is the chairman of an aptly named think tank, the Institute for the Study of War. Though he is one of a parade of cable-TV generals, Keane is the resident hawk on Fox News, where he appears regularly to call for the United States to use greater military force in Iraq, Syria and Afghanistan. He doesn’t shrink from putting boots on the ground and has little use for civilian leaders, like Obama, who do. Keane first got to know Clinton in the fall of 2001, when she was a freshman senator and he was the Army’s second in command, with a distinguished combat and command record in Vietnam, Somalia, Haiti, Bosnia and Kosovo. He had expected her to be intelligent, hard-working and politically astute, but he was not prepared for the respect she showed for the Army as an institution, or her sympathy for the sacrifices made by soldiers and their families. Keane was confident he could smell a phony politician a mile away, and he didn’t get that whiff from her. Clinton took an instant liking to Keane, too. “She loves that Irish gruff thing,” says one of her Senate aides, Kris Balderston, who was in the room that day. When Keane got up after 45 minutes to leave for a meeting back at the Pentagon with a Polish general, she protested that she wasn’t finished yet and asked for another appointment. “I said, ‘O.K., but it took me three months to get this one,’ ” Keane told her dryly. Clinton exploded into a raucous laugh. “I’ll take care of that problem,” she promised. She was true to her word: The two would meet many times over the next decade, discussing the wars in Afghanistan and Iraq, the Iranian nu­clear threat and other flash points in the Middle East. Sometimes he dropped by her Senate office; other times they met for dinner or drinks. He escorted her on her first visit to Fort Drum and set up her first trip to Iraq. They generally agreed to forgo talk of politics, but at a meeting in Clinton’s Senate office in January 2007, Keane tried to sell her on the logic of a troop surge in Iraq. The previous month, he had met with President Bush in the Oval Office to recommend that the United States deploy five to eight Army and Marine brigades to wage an urban counterinsurgency campaign; only that, he argued, would stabilize a country being ripped apart by sectarian strife. His presentation angered some of Keane’s fellow generals, who feared that such a strategy would deepen Iraq’s dependency and prolong America’s involvement. But it had a big impact on the commander in chief, who soon ordered more than 20,000 additional troops to Iraq. He and Clinton continued to talk, even after Obama was elected and she became secretary of state. More often than not, they found themselves in sync. Keane, like Clinton, favored more robust intervention in Syria than Obama did. In April 2015, the week before she announced her candidacy, Clinton asked him for a briefing on military options for dealing with the fighters of the Islamic State. Bringing along three young female analysts from the Institute for the Study of War, Keane gave her a 2-hour-20-minute presentation. Among other steps, he advocated imposing a no-fly zone over parts of Syria that would neutralize the air power of the Syrian president, Bashar al-Assad, with a goal of forcing him into a political settlement with opposition groups. Six months later, Clinton publicly adopted this position, further distancing herself from Obama. Befriending Keane wasn’t just about cultivating a single adviser. It gave Clinton instant entree to his informal network of active-duty and retired generals. The most interesting by far was David Petraeus, a cerebral commander who shared Clinton’s jet-fueled ambition and whose life stories would mix heady success with humbling setbacks. Both would be accused of mishandling classified information — Clinton because of her use of a private server and email address to conduct sensitive government business, a decision that erupted into a political scandal; Petraeus because he had given a diary containing classified information to his biographer and mistress (he was eventually charged with a misdemeanor for mishandling classified information). On Clinton’s first trip to Iraq in November 2003, Petraeus, then a two-star general commanding the 101st Airborne Division, flew from his field headquarters in Mosul to the relative safety of Kirkuk to brief her congressional delegation. “She was full of questions,” he recalls. “It was the kind of gesture that means a lot to a battlefield commander.” On subsequent trips, as he rose in rank, Petraeus walked her through his plans to train and equip Iraqi Army troops, a forerunner of the counterinsurgency strategy in Afghanistan. It worked to their mutual benefit: Petraeus was building ties to a prominent Democratic voice in the Senate; Clinton was burnishing her image as a friend of the troops. “She did it the old-fashioned way,” he says. “She did it by pursuing relationships.” When Petraeus was sent back to Iraq as the top commander in early 2007, he gave every member of the Senate Armed Services Committee a copy of the U.S. Army/Marine Corps Counterinsurgency Field Manual, which he edited during a tour at Fort Leavenworth. Clinton read hers from cover to cover. The next time she found herself in a debate over sending troops into harm’s way, she voiced no such reservations. “We need maps,” Hillary Clinton told her aides. It was early October 2009, and she had just returned from a meeting in the Situation Room. Obama’s war cabinet was debating how many additional troops to send to Afghanistan, where the United States, preoccupied by Iraq, had allowed the Taliban to regroup. The Pentagon, she reported, had used impressive, color-coded maps to show its plans to deploy troops around the country. The attention to detail made Gates and his commanders look crisp and well prepared; the State Department, which was pushing a “civilian surge” to accompany the troops, looked wan by comparison. At the next meeting, on Oct. 14, the team from State unfurled its own maps to show the deployment of an army of aid workers, diplomats, legal experts and crop specialists who were supposed to follow the soldiers into Afghanistan. Clinton’s fixation with maps was typical of her mind-set in the first great war-and-peace debate of the Obama presidency. She wanted to be taken seriously, even if her department was less central than the Pentagon. One way to do that was by promoting the civilian surge, the pet project of her friend and special envoy to the region, Richard Holbrooke. “She was determined that her briefing books would be just as thick and just as meticulous as those of the Pentagon,” a senior adviser recalls. She also didn’t hesitate to get into the Pentagon’s business, asking detailed questions about the training of Afghan troops and wading into the weeds of military planning. “Hillary was adamant in her support for what Stan asked for,” Gates says. “She made clear that she was ready to support his request for the full 40,000 troops. She then made clear that she was only willing to go with the 30,000 number because I proposed it. She was, in a way, tougher on the numbers in the surge than I was.” Gates believed that if he could align Clinton; the chairman of the Joint Chiefs of Staff, Mike Mullen; the commander of Central Command, David Petraeus; and himself behind a common position, it would be hard for Obama to say no. “How could you ignore these Four Horsemen of national security?” says Geoff Morrell, who served as the Pentagon press secretary at the time. David Axelrod recalls one meeting where Clinton “kicked the thing off and pretty much articulated their opinion; I’m sure that’s one that they remember. There’s no doubt that she wanted to give them every troop that McChrystal was asking for.” Still, Clinton didn’t prevail on every argument. After agreeing to send the troops, Obama added a condition of his own: that the soldiers be deployed as quickly as possible and pulled out again, starting in the summer of 2011 — a deadline that proved more fateful in the long run than a difference of 10,000 troops. Clinton opposed setting a public deadline for withdrawal, arguing that it would tip America’s hand to the Taliban and encourage them to wait out the United States — which, in fact, was exactly what happened. Much of Eikenberry’s analysis proved prescient, particularly his warnings about the threadbare American partnership with the Afghan president, Hamid Karzai. It carried an extra sting because he was a retired three-star Army general who was the commander in Afghanistan from 2005 to 2007. Clinton, who had not asked for the cable, was furious, fearing it could upset a debate in which she and the Pentagon were about to prevail. What the cable made clear was the degree to which the Afghanistan debate was dominated by military considerations. While Clinton did raise the need to deal with Afghanistan’s neighbor, Pakistan, her reflexive support of Gates, Petraeus and McChrystal meant she was not a powerful voice for diplomatic alternatives. “She contributed to the overmilitarizing of the analysis of the problem,” says Sarah Chayes, who was an adviser to McChrystal and later to the chairman of the Joint Chiefs of Staff, Mike Mullen. In October 2015, the persistent violence in Afghanistan and the legacy of Karzai’s misrule forced Obama to reverse his plan to withdraw the last American soldiers by the end of his presi­dency. A few thousand troops will stay there indefinitely. And for all of Clinton’s talk about a civilian surge, it never really materialized. “There’s no doubt that Hillary Clinton’s more muscular brand of American foreign policy is better matched to 2016 than it was to 2008,” said Jake Sullivan, her top policy adviser at the State Department, who plays the same role in her campaign. It was De­cem­ber 2015, 53 days before the Iowa caucuses, and Sullivan was sitting down with me in Clinton’s sprawling Brooklyn headquarters to explain how she was shaping her message for a campaign suddenly dominated by concerns about national security. Clinton’s strategy, he said, was twofold: Explain to voters that she had a clear plan for confronting the threat posed by Islamic terrorism, and expose her Republican opponents as utterly lacking in experience or credibility on national security. Yet such spikes in the public appetite for mili­tary action tend to be transitory. Three weeks later, the same poll showed an even split, at 49 percent, on whether to deploy troops. Neither Trump nor Cruz favors major new deployments of American soldiers to Iraq and Syria (nor, for that matter, does Clinton). If anything, both are more skeptical than Clinton about intervention and more circumspect than she about maintaining the nation’s post-World War II military commitments. Trump loudly proclaims his opposition to the Iraq War. He wants the United States to spend less to underwrite NATO and has talked about withdrawing the American security umbrella from Asia, even if that means Japan and South Korea would acquire nuclear weapons to defend themselves. Cruz, unlike Clinton, opposed aiding the Syrian rebels in 2014. He once supported Pentagon budget constraints advocated by his isolationist colleague, Senator Rand Paul of Kentucky. Thus might the gen­eral election present voters with an unfamiliar choice: a Democratic hawk versus a Republican reluctant warrior. In showing her stripes as a prospective commander in chief, Clinton will no doubt draw heavily upon her State Department experience — filtering the lessons she learned in Libya, Syria and Iraq into the sinewy worldview she has held since childhood. Last fall, in a series of policy speeches, Clinton began limning distinctions with the president on national security. She said the United States should consider sending more special-operations troops to Iraq than Obama had committed, to help the Iraqis and Kurds fight the Islamic State. She came out in favor of a partial no-fly zone over Syria. And she described the threat posed by ISIS to Americans in starker terms than he did. As is often the case with Clinton and Obama, the differences were less about direction than degree. She wasn’t calling for ground troops in the Middle East, any more than he was. Clinton insisted her plan was not a break with his, merely an “intensification and acceleration” of it. It’s an open question how well Clinton’s hawkish instincts match the country’s mood. Americans are weary of war and remain suspicious of foreign entanglements. And yet, after the retrenchment of the Obama years, there is polling evidence that they are equally dissatisfied with a portrait of their country as a spent force, managing its decline amid a world of rising powers like China, resurgent empires like Vladimir Putin’s Russia and lethal new forces like the Islamic State. If Obama’s minimalist approach was a necessary reaction to the maximalist style of his predecessor, then perhaps what Americans yearn for is something in between — the kind of steel-belted pragmatism that Clinton has spent a lifetime honing. “The president has made some tough decisions,” says Leon Panetta, who served as Obama’s defense secretary after Bob Gates, and as director of the C.I.A. before David Petraeus. “But it’s been a mixed record, and the concern is, the president defining what America’s role in the world is in the 21st century hasn’t happened.